Excellent shots on Epson paper, but what about the build? The PictureMate 500 is undoubtedly a nice printer - such a shame it died on us. 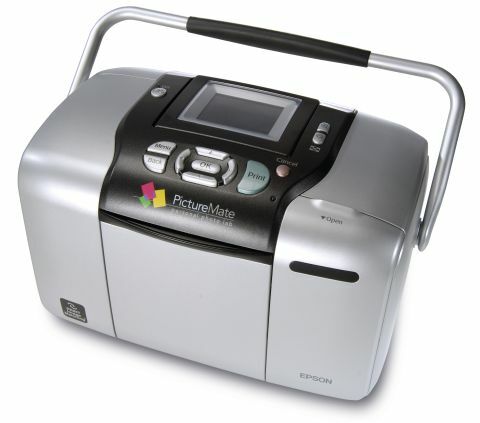 Essentially, the PictureMate 500 carries on from where the PictureMate left off in our June 2005 test. Epson has added in a few much needed extras, like a colour LCD and a battery for mobile use, but has decided against Bluetooth, which remains an optional extra. Prints came out with fine resolution, but they were still slightly on the cold side - a point picked up last year in the previous mini printer test. This was the first printer we printed from in the test, and so we found ourselves coming back to its prints as the benchmark. Epson produces excellent photo paper and the PictureMate 500 makes the most of it. While the HP 475 still had the kind of warm colour saturation we favour, the PictureMate beat it on fidelity and resolution. The software is simple and you can choose menu options set on layers above the image, which gives it an intuitive ease. Bizarrely, when we came back to do our second round of testing the images were washed-out and mostly green. This couldn't be due to the ink running low, because Epson's cartridges are massive and we had only printed off a dozen prints. We considered changing the ink cartridges around, but unfortunately at this point the printer just died. All rather worrying. Up until then - Martian-esque second wave of images aside - it was a pretty competent machine, and its first round of prints were excellent. Sadly, though, we can only work with what is in front of us. The build quality is a bit rickety on this printer, especially on the door panel that opens to reveal the memory slot options. Perhaps build had something to do with it - whatever the case, we don't recommend writing off the whole line. It is most likely a solid printer and this was just one of those things.